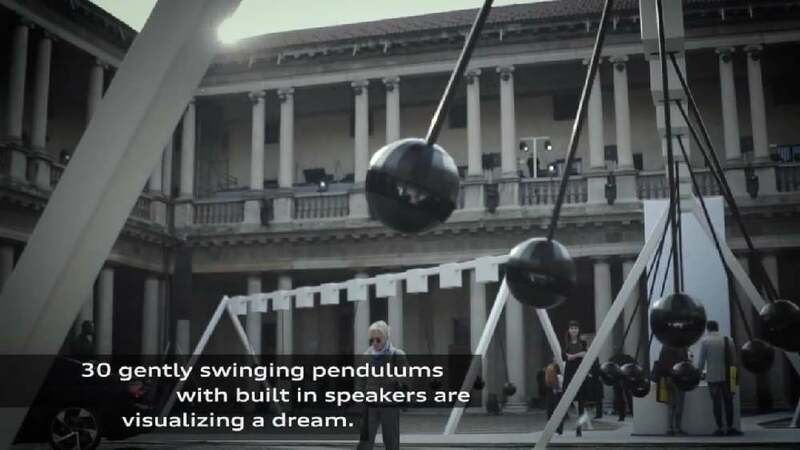 “Sonic Pendulum” is a sound installation based on the concept of having arti-ficial intelligence imagine and materialise an endless soundscape. Its struc‑ ture is composed of 30 pendulums that modulate the sound gently emanating from the speakers through a Doppler effect. An algorithm that continuously generates a calming and ambient-like bassline also processes and integrates the sounds and disturbances around the space generated by the installation visitors. The result is an ever-evolving piece of art that is constantly changing. Located inside a historic former seminary in Milan, Italy, this temporary installation at the Milan Design Week 2017 showcased the “soul” of the Audi A5 family.